Join us at the Bristol Sound & Vision Show this weekend and see our 4K vs OLED demo | What Hi-Fi? Check out our unique 4K vs OLED demo, enter our £10k prize giveaway, meet the team and join the What Hi-Fi? Club – all at the Bristol Show 2014! The Bristol Sound & Vision Show 2014 is open for business and we've had visitors queuing round the block all morning for our 4K vs OLED TV demo, as you can see in the picture above. Dynaudio Contour 7.2 package – £18,850 total. As well as the demo, the entire What Hi-Fi? Sound and Vision editorial team is on hand to answer your hi-fi and home cinema queries, you can get a FREE pair of Award-winning AKG K451 headphones (worth £50) if you sign up for our special show subscription offer, and we have £10,000 of Award-winning kit up for grabs in our show competition. What's more, we are launching the What Hi-Fi? Club. 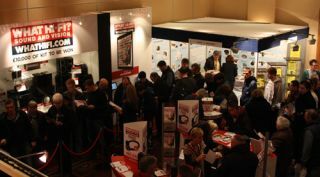 Join up for free at the show and you'll automatically be entered into the show competition, plus have the chance to become an approved whathifi.com user reviewer, receive a free digital copy of the magazine and have privileged access to the beta version of our new website. Full details of all the exhibitors at the show are in our Bristol Show 2014 blog.